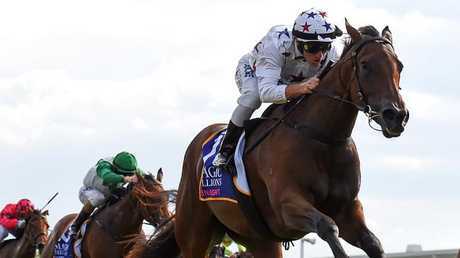 Sunlight will be aimed at the Golden Slipper after romping to victory in the Magic Millions Classic. TONY McEvoy's meticulous preparation and Luke Currie's cool ride helped land gifted filly Sunlight a huge payday in a rough-house Magic Millions 2YO Classic on the Gold Coast on Saturday. 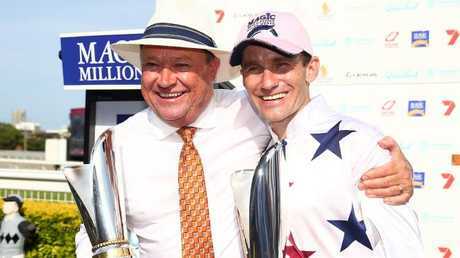 Now McEvoy is eyeing off a Golden Slipper campaign, where he hopes Sunlight can become the fourth horse - and first filly - to complete the double. Matt McGillivray shot across the field on Ef Troop in the first 200m and attempted to cross to the fence before he was fully clear of Sunlight and Secret Lady. Currie was able to compose Sunlight and get her into a nice trail behind Ef Troop, before pouncing when that horse's bowser hit empty halfway up the straight. McGillivray was later suspended for one month after causing interference. 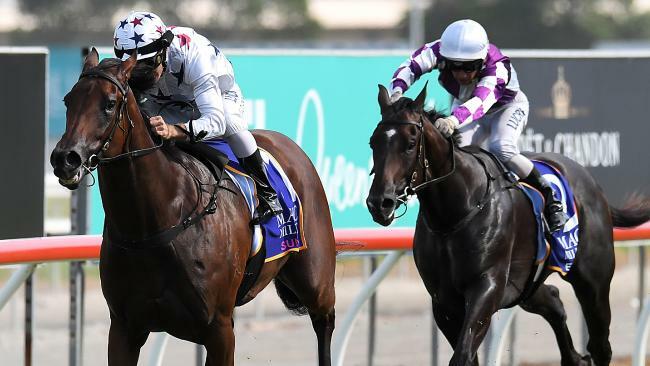 Sunlight showed her quality with a dominant win in the Magic Millions Classic. In winning, Sunlight became the most expensive horse to win the Magic Millions, eclipsing 2005 winner Bradbury's Luck ($225,000) after being a $300,000 purchase for McEvoy Mitchell Racing and Julian Blaxland's Blue Sky Bloodstock last year. Like champion trainer Chris Waller noted following his successes earlier in the day, McEvoy said getting Sunlight to Queensland seven weeks ago was a huge factor in her success. "She acclimatised and handled the heat really well," McEvoy said. "That preparation, having the run last week and when the high pressure was on, she lifted late. "She's a star filly and I'm very pleased to be training her." McEvoy and Currie have formed a superb partnership in recent times, combining to win dual Group 1 races with Hey Doc in 2017 and now kicking off the new year with a win in Saturday's $2 million feature race. Currie said the relationship has been a turning point in his career. "He's building a bigger and better stable all the time so it's a privilege to ride for him," he said. Currie said Sunlight didn't "spring" as well as she has in her previous two wins and then had to navigate a precarious path when Ef Troop tightened him for room. "Ef Troop came across quite abruptly and put us all in a bit of bother," Currie said. "It was important to hold my spot and it was a matter of sitting off it and not getting to it too soon. She settled off it and it was a matter of how far. "Coming to the corner I could see the leader was already slightly under the pump and as long as I saved her enough to get around the corner, she was the fittest horse in the race and was always going to be tough to get past." Stuart Kendrick had a team of owners around him celebrating as if they had won the race themselves after Fullazaboot charged home in the final stages to grab second place and be the best of the locals. "It gives you a lot of enthusiasm going forward with him," Kendrick said. "It was a huge run. He was a bit slow to go then he had to go around them. He's done a good job. We will put him out now and get ready for the winter carnival."